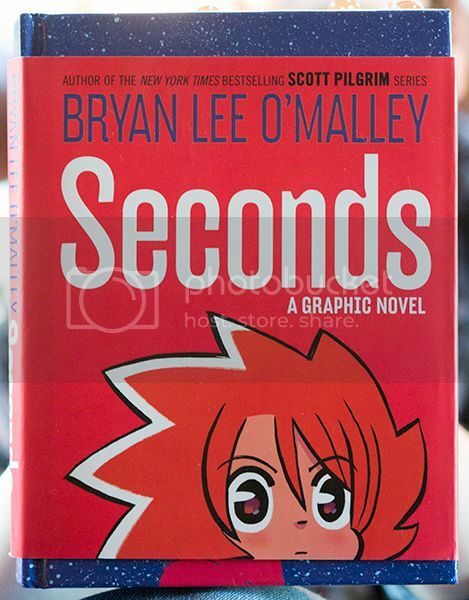 With 2014 beginning to fade from recent memory, it’s about time I write about my favorite graphic novel of the preceding year: Bryan Lee O’Malley’s book Seconds. Released over the summer, it is O’Malley’s first published work since the last Scott Pilgrim installment was issued in 2010. The story follows Katie, a young chef trying to open another restaurant so she can leave Seconds (her first culinary establishment and the place where she lives in an apartment upstairs). After a dramatic incident in which a young waitress gets injured, Katie discovers her resident house spirit, who gives her a mushroom and an opportunity to erase a mistake and rewrite events. Soon afterward, Katie finds a patch of these mushrooms and begins abusing their power, despite Lis, the house spirit’s insistence that they should only be used once per person. The back of the book, with dust jacket partially pulled back to show the design underneath. The book itself is beautiful. 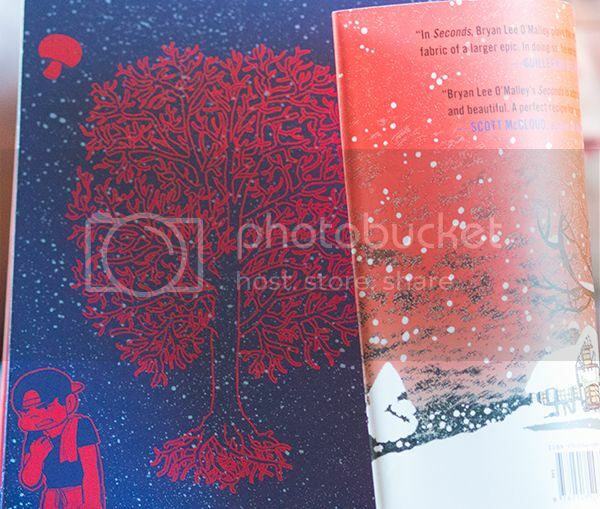 The half dust jacket and cover boards have different designs, giving it a unique style. I’m also a sucker for any novel that takes the color of the panel lines into account (props to the colorist, Nathan Fairbairn). Seconds differs quite a bit from the Scott Pilgrim series, and more resembles his first graphic novel Lost at Sea. The book is a single, contained story, rather than a series released manga-style. The story also incorporates a narrator, though there is some witty banter exchanged between it and the main character, implying that the narrator may be an inner voice of Katie’s. These quirks bring the story to life. There are even some nods to Scott Pilgrim for O’Malley’s dedicated fans. (Scott and Ramona are eating in the restaurant on page 259, for example). 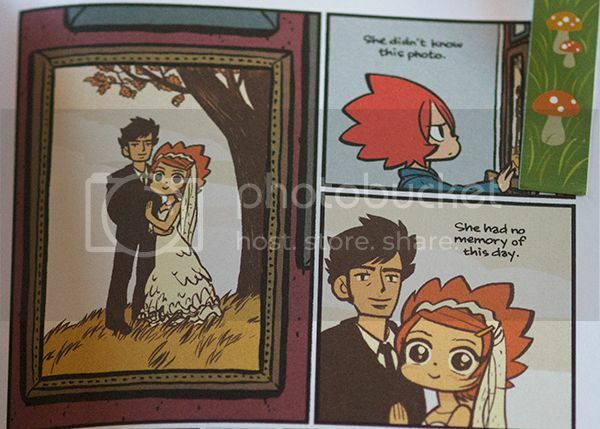 Main character Katie looking pretty cartoony next to her hunky new husband. (Ignore my appropriately themed bookmark in the upper right). One of the Second’s flaws is its main character, which is admittedly sort of the point–she is flawed to a fault. As she digs herself farther into trouble by continuing to eat the mushrooms that erase her numerous mistakes, it seems to take an unbelievable amount of time for her to learn from these errors. She is hard to root for. Katie differs even in style from the others. O’Malley’s style is cartoony, but Katie’s design takes it to another level, as she is the only character with gravity-defying anime hair. There is nothing groundbreaking in Seconds; no new story elements or decisions that set it far apart from other works, but it has just the right amount of humor, quirk, and design to make it pop. I want more graphic novels like this, with a single developed story that plays with narrative styles, and some nice resolution at the end. Seconds is worth checking out, and not just for Scott Pilgrim fans. This entry was posted by Mel Staten on January 14, 2015 at 7:31 pm, and is filed under Books, Comics, Manga, Review. Follow any responses to this post through RSS 2.0.Both comments and pings are currently closed.